For months, the merciless Ironfang Legion has struck out against humanity from its impenetrable, otherworldy Onyx Citadel! But now in possession of a key to this stronghold, the bold adventurers must rally their allies, breach the barrier between worlds, tame an alien wilderness, and finally bring the fight to their hobgoblin conquerors! Can the heroes best the Legion's most devious commanders including the unparalleled warrior-general Amersi, or will they fall as readily as their homeland before hobgoblin blades? 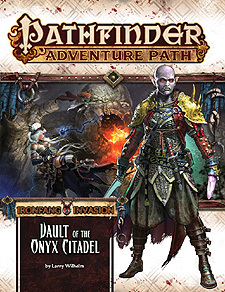 "Vault of the Onyx Citadel," a Pathfinder adventure for 16th-level characters, by Larry Wilhelm. Suggestions for continuing the campaign beyond the adventure's end, including a gazetteer of the Vault of the Onyx Citadel, by Crystal Frasier. An ecology of the Vault Keepers and the mythic Vault Builders, who together compose the xiomorn race, by Greg A Vaughan. Details on the powerful xiomorn-crafted relics adventurers may find when exploring the Vault of the Onyx Citadel, by Tim Hitchcock. A bestiary packed with elite Ironfang Legion troops and denizens of the Plane of Earth, by Paris Crenshaw, Kalervo Oikarinen, and Larry Wilhelm.